The Foreseeable Future Foundation works to enable the visually impaired to live fulfilling lives through sport and recreation, while increasing public awareness to the challenges facing the blind. 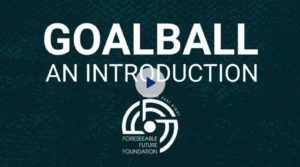 GoalBall is a game somewhat like soccer, pitting three sight-impaired players on each team who score goals by getting their ball, which contains sounds, past the defensive line and into the net. Alouette created this animated video to help potential players understand the game and gain support for the Foundation and its work.